Forum Index > Historical Arms Talk > Horn nocks on bows. Posted: Mon 04 Sep, 2017 7:08 am Post subject: Horn nocks on bows. Were horn nocks on longbows an exclusively English thing during the Middle Ages? ... or were they used by other European cultures that practised long/selfbow archery? f.ex. the Scandinavians which were the other famous Longbow users of the Middle Ages. Just wondering whether to order my Medieval Yew longbow with or without them because I want it to be usable at Viking festivals. For the log or for the finished bow? Whats the price for a good wyck elm stave and bow? There is a yew longbow with normal stringnocks, dated somewhere between 700 and 900 AD. from Aalsum, Nederlands. These days everybody seems to be using either those Victorian 'longbows' or more genuinely medieval English longbows, even at Viking age re-enchantment events they use what are basically 14th century English longbows with horn nocks. Reading the literature today one gets the feeling that longbows are a quintessentially English thing (presumably because of the popularity of the English bows due to the Crecy/Agincourt/Poitiers hype) but they weren't. What interests me just as much as English longbows is continental longbows so I did some more research. For one thing continental longbows existed, and they were used by armies into the High Middle Ages but where the English mostly recruited longbowmen and some crossbowmen if they could get them the situation was reversed on the continent as is well known and much written about. Longbow archers were rare so it was easier to train a thousand plowboys and city militia into competent crossbowmen but if you could dig up some backwoodsmen and marchers who knew their way around a longbow it seems these were happily recruited. 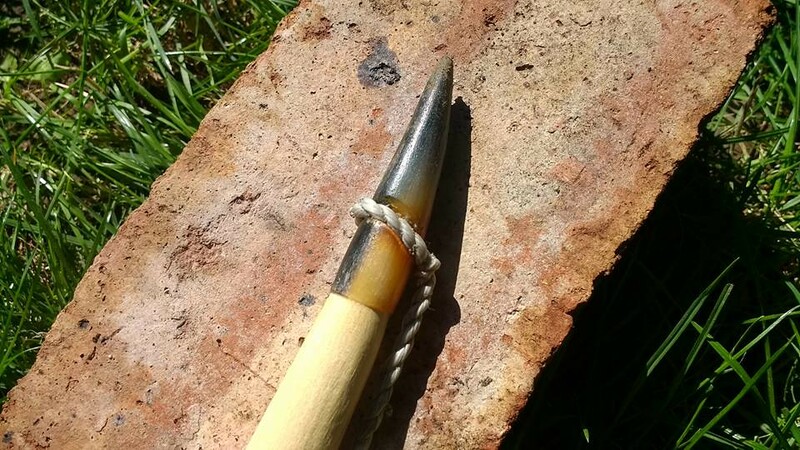 Continental longbows do not seem to have used the horn nocks, instead they re-enforced the nock point with sinew and often only had a nocking groove on one side of the stave while the other end of the string was sometimes being tied to the stave rather than nocked. If both ends were nocked there was only one nocking groove at each end and the groove at the upper end was on the opposite sides of the stave to the one at the lower end. It is interesting how this continental longbow tradition is so very different from what the English were doing. Mind you this only applies to Scandinavian and N-German Longbows of the 9th to 13th centuries. About prices: The going rate for a yew longbow is from between 550 EUR for a 50 pound bow to well over 1000 EUR for a massive warbow. Jürgen Junkmanns charges from 650 EUR, for a 50 pound yew longbow to 750 EUR for a 70 pound one which is actually kind of cheap (relative to what sine other others charge for yew longbows), some of the British bowyers charge considerably more. For comparison, if you choose hickory, Junkmanns charges 400,00 for a 50 pound to 500,00 for 70 pound bow. You can get reproductions of iron age and medieval ash bows from E-Europe for anything down to around 200 EUR, or perhaps a bit less. But in the end these things are usually hand made which costs money and Yew is not exactly an easy wood to get which explains the premium on Yew bows. I've just always shot glass fibre bows and a Victorian bow made out of some mystery wood and I'd like to see what all the hullabaloo concerning yew bows is about. Reproduction of one of the Haitahbu bows by Jürgen Junkmanns (and I think it qualifies as a longbow) plus a close up of the single groove sinew re-enforced nocking point. There are finds from Holstein in Germany dating to the 12th century of essentially similar yew bows. The only pre medieval bows I have seen have had nocks like Jurgens, reinforced with sinew. I don't know if the originals had sinew or wrapped string reinforcements, these would be very susceptible to rotting. Reinforcement is a really good idea for yew as self nocks can split off, especially when you talk about heavier war bows. As for the price of a yew bow, they aren't cheap but they are a pretty fair price when you know what goes into making one. The stave alone retails for US $250(though they can be bought for a lot less), and that price hasn't gone up in the 21 years I have been a bowyer. If you had to pay the price that select wood for musical instruments gets, a yew stave would probably be worth $1000.At $250 a yew stave is good value in comparison. So $250 of the price is a cost to the bowyer, and doesn't go into his pocket. Most bowyers are not full time and their day job actually subsidises the price you pay. Labour costs are charged at a ridiculously low hourly rates for the amount of time. Tools electricity, rent, advertising are probably not factored in the final price of the bow. You will never see a rich man from being a self bowyer unless they have inherited their money. 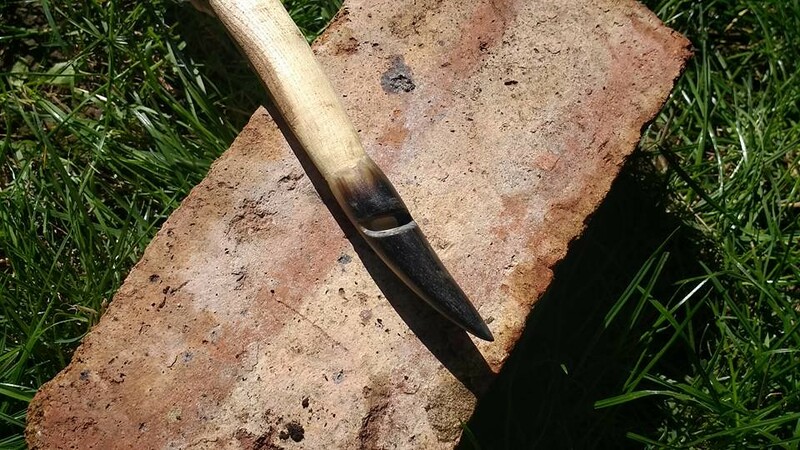 It's safe to say all medieval English bows had sidenocks - the groove cut on just one side of the tip. This is different on modern and Victorian bows, where the groove is cut across the back of the bow tip. Sidenocks work superbly well with natural fibre strings - linen and hemp in particular. They're not great with modern strings such as FastFlight but can be made to work with a bit of tweaking. If you really want a truly medieval English longbow, sidenocks are an absolute must. The trouble is, most bowyers can't get them to work on very heavy bows so ignore them, and most archers have no idea they exist, so don't ask for them. This means you see a load of medieval reenactors using yew bows with Victorian nocks. As for the price of yew it is and has always been vastly overpriced. It's just wood - it quite literally grows on trees. I can't think of many European countries that don't have yew growing, and England especially has vast amounts if you're willing to sort through some of the poor quality stuff. It certainly doesn't need paying for, but people still do, so the price is still stupidly high. The funny thing is, yew is the easiest wood to make into a bow - if anything, it should be far cheaper to buy a yew bow than any other bow, because any good bowyer can turn out an authentic medieval military weight yew bow in less than a day. The problem with yew is that it is not a readily available species commercially, in comparison to say hickory. This is partly because they don't yield much timber being a small to medium tree, unless its several hundred years old. Its always had an air of exclusivity around it, the premium wood for steam bent windsor chair bows, and in expensive musical instruments like lutes. It also takes a hell of a lot longer to grow a yew tree so its big enough to make a good bow. Plant one at the birth of your first child and it might just be a reasonable size when the child is now an 80 year old. Plant a hickory or osage today and you could be shooting a bow in 10 years, 20 years for sure. Okay a bow can be made from perfect wood in a day, even much quicker. It will be functional but it will have tool marks, or a poor finish. The horn nocks aren't going to be very refined, they will have had to be put on with superglue. In the same way you can get a hamburger at McDonalds in 5 mins, its not going to taste as good as one made at a resteraunt, by a chef, from premium ingrediants and takes several times longer. Its going to cost a lot more. With a bow like Jurgen's you would need 2 separate operations to steam bend and clamp until dry, minimum of 1 day per tip, for the viking style tips Theres set up time for the steam bending equipment, unless you have a massive workshop with a permanent set up. Plus you need time to wrap the sinew nock reinforcements, and let them cure enough before putting on a professional looking finish, possibly over several days more, if it requires several coats. The bow might be tillered in a day, but it won't be fully ready to be sent to the customer in less than a week. When your supply of perfect yew runs out, you would need to resort to average quality yew, knots that need to be compensated for, kinks that need to be straightened with heat, that splinters out when you try to use a spokeshave on it. Your one bow a day now stretches out to over 3 or 4 days until its tillering is finished. I understand what you're saying about the time it takes to make a bow of course - and in fact if you read pretty much every bow making book or article you will be told that wood needs to be exercised and stretched and "taught to bend" and so on but I think you're approaching it from a modern perspective. While it does make a bow safer for a customer, and therefore less of a problem for the bowyer, it's not how medieval bows would have been made. The bowyers were expected to turn out a good 2 or 3 bows each day, and this is only possible when dealing with heavy bows when you make them in a certain way. With experience and good quality staves, most of the "tillering" is done at brace height - the bow is shaped and finished with horns fitted (using hide glue this only takes a few minutes, as compared to a day when using modern epoxies) and then taken up to brace height immediately. Hinges, stiff spots and other issues are very apparent at this stage, and are corrected. The bow can then be taken to around 25" and checked and heat treated if necessary, and then taken to full draw for certainty, or simply thrown onto the pile if the bowyer is confident enough. The tool marks can be worked out as the bows are shaped. but if you look at the Mary Rose bows as an example, most of the tool marks are still there. The bellies of the bows show clear plane and flote marks, as they're not a safety issue. We're not talking rough, nasty looking bows of course, but we're also not talking about polished, 800 grit sandpaper Victorian sporting bows either. I think what's important is getting away from the modern way of thinking, and approaching bow making in a mass production, millitary mindset. Modern epoxy glues, modern poly finishes and bows made for paying customers is a far cry from livery issued military bows, with quick finishes (remember of course that yew bows don't even need a finish, they're quite good at resisting rot and moisture hardly affects their performance unlike meanewood bows) and traditional glues. Here's a couple of pics of the 135lb elm bow I made recently, in about 3 hours from raw stave to finished bow. It doesn't have any tool marks, and does have a finish of pine resin and beeswax. It's also quite a good example (I think) of medieval sidenocks, and how different they are to Victorian and modern nocks which you often see on "medieval" bows! Nice bow Will. A wax finish is a good for repelling moisture and quick to put on or rejuvenate further down the track. I agree with you on the medieval bowyers approach. They were not trying to bring a bow to a set weight, but rather get the heaviest useable draw weight the stave can provide. Results would have varied due to different staves density and individuality and provide a range of weights for bowmen of different strengths. I guess my rant was more about non bowyers perceptions on value. Very often they don't seem to know how reasonable a deal they are getting. Some guys are selling bows on ebay for a price that barely covers materials. Some of these bows are actually very good, but just as many from others are poorly tillered, poorly finished or masquerading as "authentic" but aren't really. Despite making wood bows for a long time I still occasionally buy bows from other bowyers, or pick them up second hand. Many times I feel like I am almost stealing from them. At the very least I always felt like I was getting them at a reasonable price, rather than being squeezed. I think there's a real problem at the moment with yew bows in particular. I genuinely believe it's one of the easiest woods to make a bow from, and I also know from my personal experience that getting hold of yew really isn't hard at all. For some reason however, the price of yew bows is astronomical. There's one particular bowyer who I won't name who is currently charging £800 for a 30lb yew bow which is completely criminal as far as I'm concerned! It's even more outrageous when you realise he's not even paying for the wood, but cutting it himself in his local woodland. The bows themselves are also very average - ugly nocks, incorrect cross section for medieval bows and so on. There are a few bowyers who will charge somewhere around that price, but they are extremely skilled, their bows perform exceptionally well (and we're talking 150lb, 170lb bows here) and they are also buying the staves. If you have to buy the staves then of course the price should reflect that, as you must make a profit, but then if you buy a yew stave, you'll be buying a good clean one which therefore means you can make the bow in a few hours, as you don't need to worry about knots, twist, heat bending and so on. Unfortunately it seems the myth and legend of yew as a bow wood has given bowyers the opportunity to steal blindly from customers. It's not better bow wood, it's just quicker. That's why they used it so often, whereas today it seems people believe that a bow made of yew will somehow outperform anything else. Without naming names, would that be a bowyer from the mediterranean region? "If they pay a penie or two pence more for the reddinesse of them..let them looke to that, a foole and his money is soone parted." No. Somewhere on the other side of the Great Pond. I am not an archer, so the significance of side-nocks is lost on me. Are they used because it is better for the bow (as you don't have a string pulling directly into a newly formed weakspot), or is it just a tradition? Also, is there any evidence of non-yew longbows being used in England across the period of its use? I don't think I've encountered any but I have not done much bow-specific research in a long time, I am afraid. It sounds to me like it was exclusively yew, but I still wonder. Sidenocks are far better suited to natural fibre strings on heavy bows and probably went out of fashion around the time that lighter, sporting bows with ultra thin modern material strings became prevalent. They make bracing a heavy bow much easier when not using a stringer, and in terms of actual shooting they don't make a difference, because if the string is attached using knots or nice tight loops the string actually sits virtually dead centre. As for other woods being used, we have loads of documentation from all across the medieval period that discusses "meane wood" bows - bows made of any wood other than yew. We know for a fact that medieval bowyers were required to make 2 meane wood bows for every one yew bow, and woods like wych elm, wych hazel and holly are all mentioned as good bow woods. Almost every English timber will make a bow up to around 160lb or so, including plum, ash, holly, hazel, wych elm, English elm and so on, so it's fairly safe to say these were used as well. Interesting; what was the intended goal of the "meane" wood bows? Is it just a way to supplement yew supplies? Do we know how they perform compared to yew? If yew's "claim to fame" is ease of work, it seems odd that they would be outnumbered 2:1. It is interesting you mention holly; there is a lot of that around where I grew up in the US - evidently imported due to the spines on the leaves - something to remember if I should ever try my hand at tillering! Meanewood bows are every bit as good as yew bows in terms of shooting performance, if made well enough. They do have a tendency to chrysal (which is to get small compression fractures along the belly as most meanewoods are weaker in compression than yew) which tends to result in a shorter lifespan however. If they were made for the purpose of practice this wouldn't be a problem - make them with the same draw weight as the livery issue yew bows, shoot them until they fold up and get another one. They're also much less suited to humid environments than yew. 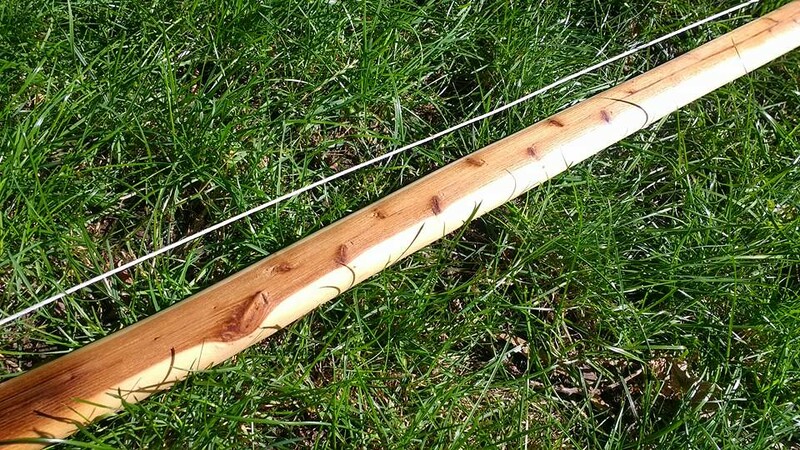 A yew bow can be shot for ages without any finish at all, be that oil, wax whatever. A meanewood bow however needs to be very well sealed against moisture otherwise it will rapidly lose performance. This might be why so few have been found - they rot easily, and perhaps also they weren't taken on campaign as often, due to the problems of keeping them very dry. Yew is easy to work, but it is also more expensive than a meanewood. If you're importing the yew then it's even more special, whereas hazel for example grows very fast, very straight and can be worked into a good heavy bow a few months after cutting. Compared to having to import or source a local yew stave that can handle heavy draw weights, which also needs to be seasoned for around 3 years you can see why supplying the masses with practice bows of yew doesn't really make sense!